What clothing do I need for a ski trip? Let's go to the mountains! Midlayer: core sweaters, heavier t-necks, lightweight jackets, or liners - take these on and off as the weather dictates. Hat and/or a face mask (balaclava). Do you want wool, fleece, or a knit hat? Do you want a beanie, a hat with a brim, or one with earflaps? What level of waterproofing do I need? Being prepared for water, be it rain, sleet, melting, or fresh falling snow is key. How do you know whether you should choose water-resistant, waterproof, or breathable? Staying dry is manageable if you've selected the right protection for the conditions you'll be in. No fabric is actually “100% waterproof.” Under enough pressure, water will get through anything, so all fabrics are actually water-resistant in that they slow down the rate at which water/moisture passes through them. There are differences in the rate at which water passes through different materials, be they synthetic materials or more natural fiber materials that have been treated somehow. Nylon resists water better than cotton but unless the nylon is treated, wind can pass through it, compounding the problem with water getting through. Materials that are higher on the waterproof spectrum will provide water-resistance for a sustained period of time. The best waterproofing is provided by the addition of coatings and/or layered membranes that have been engineered to slow down the passage of water. To correctly be labeled waterproof, a product should be made with a material that is waterproof itself, or it will include a 'waterproof' membrane or laminate. Note: The best waterproofing will also have a good breathability rating that will let out perspiration. Locking in your own perspiration is about as bad or worse than letting in wetness from the outside. (See more on Breathability below!) 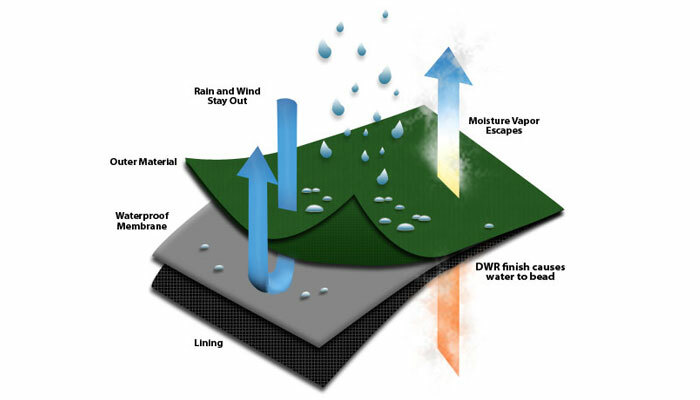 Another term you'll see is DWR (durable water repellent), a coating that improves the water resistance of a material. However DWR coatings don't provide enough protection to rank at the top of the waterproofness scale. When you see a 'mm' rating, this refers to the amount of water a fabric/material can withstand over a 24 hour period. If rated at 7,000mm waterproofing, it means this material will stand up to a column of water 7,000mm high, without letting any moisture in in a 24 hour period. MM ratings range from 3,000 or so at the low end up to 28,000 on the high end (e.g., 28,000mm Gore-Tex® rating). When you see a PSI rating, simply another way to test/state water-resistance, you need to know that common water-resistant materials withstand 3 to 5 PSI of water pressure, meaning you'll be OK if you encounter a light mist, or light rain or snow, but for just a brief period of time (and not sitting, kneeling,rolling, falling into or sliding along a wet or snowy surface.) Gore-Tex® has a water pressure rating of almost 40PSI, so you can see there is quite a difference between the least resistant to the best out there. Even if you have the best materials and/or coatings or laminates, remember that needles are often used to attach pieces of fabric together to make up garments and each needle puncture creates a small hole that may allow water to sneak inside. Highly rated water resistant clothing has either waterproof sealed or taped seams. Another garment assembly method used by some manufacturers is welded seam technology, which binds multiple fabric pieces together. Fabric welding is a bonding process that includes the use of heat and pressure to 'fuse' pieces together so no puncture marks are made in the material. Manufacturers' will typically indicate what type of seam protection is built into each of their garments, and it is frequently visible, as well. Critical Seam Sealed: Only the seams in the upper body of a garment are sealed or taped. While good protection, seams in other areas are unprotected. In addition to the seams, zippers may either be welded or have storm flaps to prevent water from entering. Waterproof and breathable fabrics are resistant to external moisture coming in but also allow perspiration vapor to pass through to the outside and are best for athletic activities. The breathability of a fabric (measured in g/m²/24 hours) tells you how many grams of moisture vapor can pass through a square meter of the material in 24 hours. The higher the rating, the better for athletic activities. Non-breathable waterproof apparel fabrics are best used for lower-intensity activities in the most extreme weather conditions. They offer very high weather protection, but don’t allow any internal moisture vapor to escape which makes them a poor choice for athletic activities like skiing and snowboarding. Most breathable and waterproof apparel fabrics consist of a membrane that contains millions of microscopic holes (aks "pores") per square inch. These tiny holes might be up to 20,000 times smaller than a drop of water but still allow molecules of water vapor to pass through. These pore size holes allow the membrane to be completely waterproof while allowing evaporating perspiration to escape. Sometimes, an oil-resistant (oleophobic) material is integrated into these membranes to prevent the penetration of body oils and other oily substances that can break down the membrane over repeated or lengthy exposure. You can see in the above illustration that when a breathable and waterproof membrane is laminated to the inside surface of a nylon or polyester fabric, it can be used to create waterproof outerwear that is much lighter and less bulky than waterproof gear of yesteryear. These newer fabrics and technologies are usually referred to as laminates. In addition to the inner layers and for added protection, most waterproof outerwear is also coated with a durable water repellent (aka DWR) treatment. A DWR treatment causes moisture to shed, bead up and roll off the surface of the garment to help maintain breathability. Examples of popular waterproof breathable fabrics are Gore-Tex® by W.L. Gore & Associates, HyVent® by The North Face, . Below are some examples of several proprietary waterproof breathable fabrics and their different ratings. For the best protection during athletic activities like snow skiing and snowboarding (as well as hiking or climbing), you'll want a breathable and waterproof jacket and pants. Breathability is essential to prevent perspiration from remaining inside the garment; if you're wet, you won't stay warm! The level of weather (waterproofing) protection you’ll need varies widely and depends upon the outdoor conditions. Be aware that there is no industry standard for waterproofness, the ratings come from the manufacturers themselves, and are subject to correction. If you have any questions about an item on our site please let us know by calling 404-252-3216 or using our convenient contact us page. Typically, waterproof wear can be machine washed and dried, but always look at the tag on the garment itself. If machine-washable always use a mild detergent and warm (not hot) water. Avoid the use of super strong cleaners and don't use fabric softeners. You don't want to harm the waterproofing coating. While you can't repair/replace a waterproof membrane if it starts to leak after years of use, but most DWR finishes can be refreshed, improving water shedding and preventing absorption. This will also help improve the breathability, as well, since a soggy garment can't breathe well. If you notice water is being absorbed and not shedding/beading up on the surface, check out the product tags. If you can, use an iron on a low, steam setting after laundering and it may revitalize the Durable Water Resistant coating as long as it hasn’t worn off completely. If ironing doesn't improve the waterproofing, try a spray-on or wash in DWR product. Follow the manufacturer's instructions! Thanks for visiting Rocky Mountain Ski and Board. We hope to have helped you with your buying decisions! We look forward to hearing from you!